I learnt this kuzhambu from my mom. She loves mango. So, she would always try to make as many dishes as possible with mango. This tastes really yummy. This is a great recipe for Mango lovers like me and my mom. 1. In a pan, add oil. Now, add the onion & curry leaves. Fry well. 2. Add Tamarind juice, water, Sambar powder, Chilli powder and salt. 3. Mix well. Allow it to boil for 5 minutes in medium heat. 4. Now, add the cut mango pieces. 5. When the contents start to thicken, add the jaggery piece. Medium the stove. 6. When you see the oil getting separated from the kuzhambu, fry vengaya vadagam and add to it. If you don't have the seasoning vadam, add mustard and urad dhal each 1 tsp fried in oil. 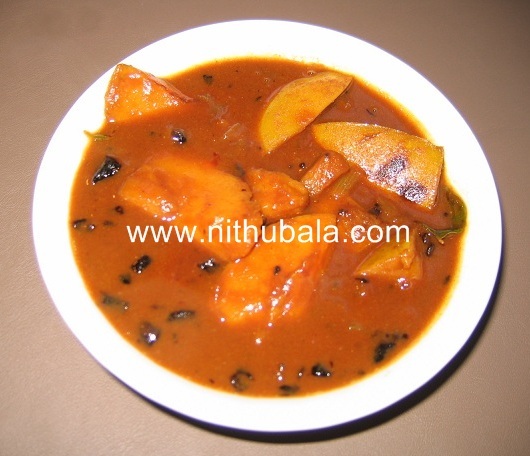 Thats a tasty mango gravy..Great recipe, Nithu..
wow nice recipe......looks so tempting. Great post Nithu..Mango gravy looks too good..love to have with rice and pappad..
Lovely Mango Kuzhambhu! Looks splendid! mmmmmmmmmmmmmmmmmmmm.. i am drooling. love the color. want to have some right now. this is new to me.. have heard abt Mambazha pulisheri, not this... looks yummy! Loving the look and sound of this gravy !!! I love this dish Nithu.Looks so tempting.If you are interested you can send this to Think spice event going on in my blog. nice kuzhambu...love the use of mangoes. Super mambazha kozhambu. Loved it and liked ur version with onions. Click is good. haaaaa, your maambazha puli kozhambu is making my mouth water; looks too good!!! Nice blog dear. This is the first time i am visiting. I would like to know with what else can this gravy be enjoyed, like besides rice ? lovely and delicious kuzhambu for a change. We make almost a similar version with green mango sans onions, called thiyya pulusu in Andhra but it would be very watery. Lovely recipe Nithu.. Thank you so mcuh for sending to my event. All look nice, Thanks for sharing. I came across your blog yesterday and tried this recipe. It was delectable. I couldn’t get enough if it. Thanks to your and ur mom for this wonderful recipe.